As you may know, homify 360°’s portfolio if filled to the brim with unique and varied architectural examples. From classic to country, and Mediterranean to Scandinavian, our collections differ widely based on location, clients’ tastes, available resources, climate, professional opinion, and, of course, the chosen style of the structure. 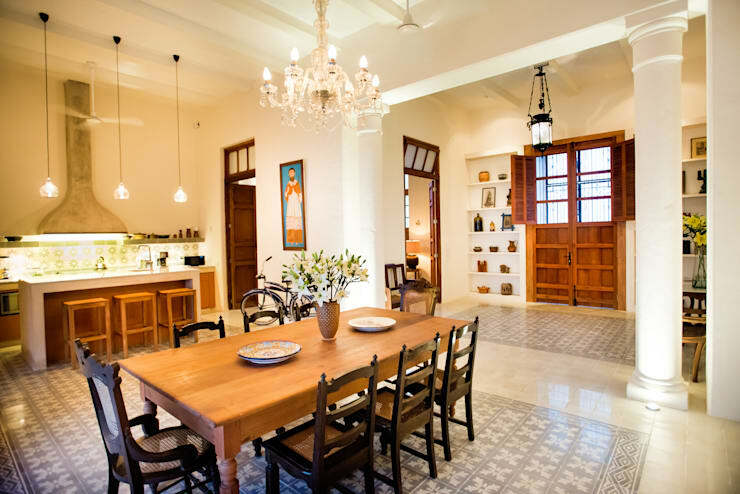 For today’s pick, we have selected an eclectic-styled residence that is home to a Mexican family, with a healthy combination of rustic, country, and contemporary elements. 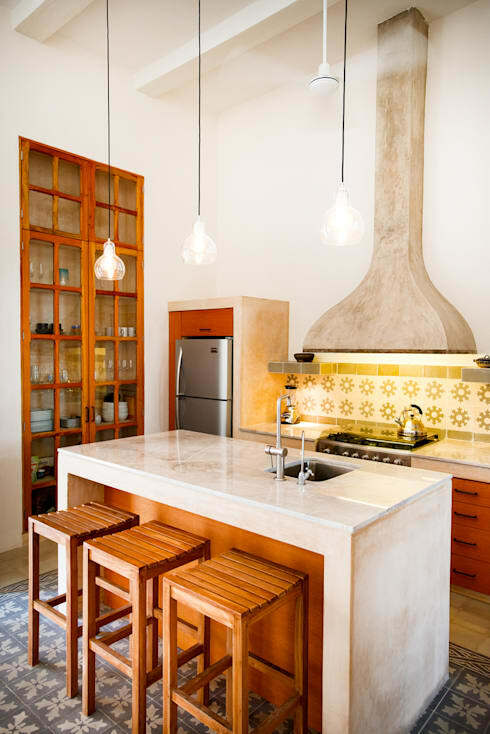 Exuding a homey vibe mixed with the right amount of charm and magic, this design comes to us from the Mexican team Taller Estilo Architects (which translates into “style workshop” in Spanish). This family home showcases architecture that is intelligent, makes use of fantastic resources for the homeowners’ comfort, and enhances every chosen detail, whether it’s the interior decor or the exterior paint colour. The dwelling place that we call our home should be more than just aesthetically pleasing – it should deliver an adequate amount of serenity and peace as well. 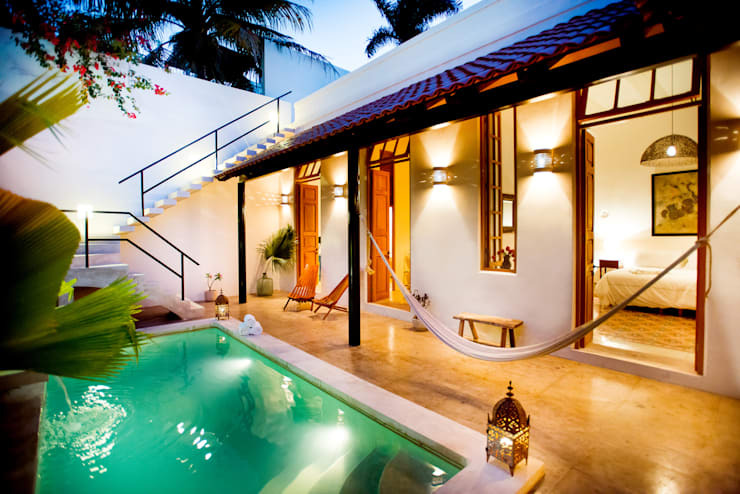 At this moment there is no way to know for sure if the interior offers these qualities, but the courtyard with this gorgeous relaxation vibe certainly does. 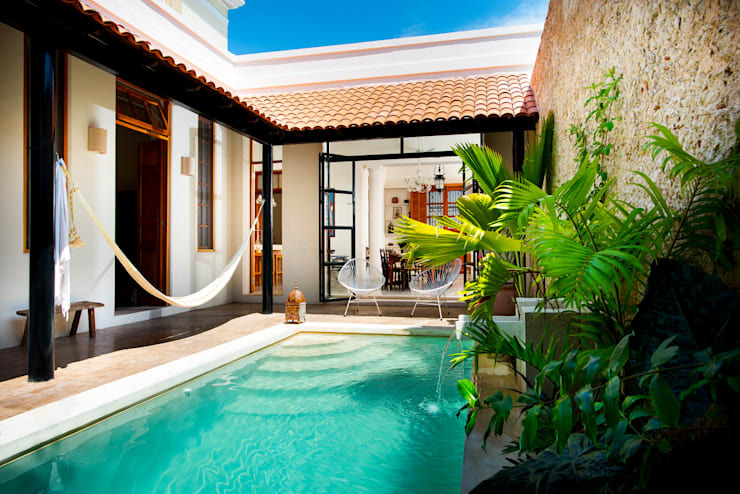 A supernatural charm radiates from the turquoise tranquillity of the pool, with adequate lounging/walking space, seating options, and even a comfy hammock for those who prefer their afternoon naps outdoors. This serves as a delicious area for a friendly gathering, or even for those lazy summer afternoons where it’s only you, the pool, and a good book to get lost in. Light, neat and comfortable can be used to describe our first impressions of the living room. An open floor plan connects most of the spaces (including that inspiring courtyard), only divided here and there by a tiny wall section or closed door. 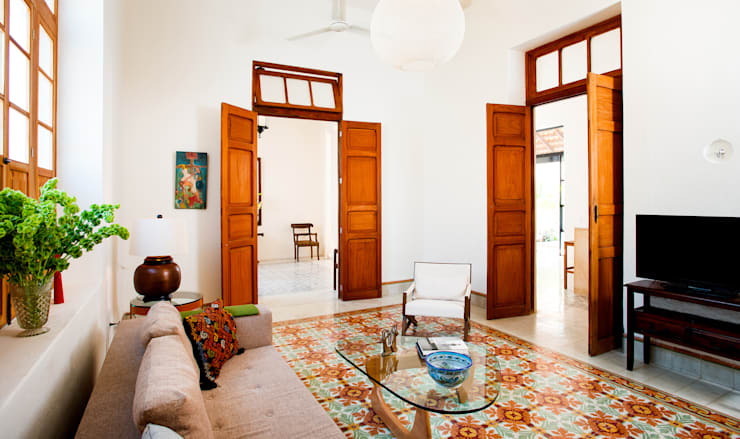 Charming wooden doors and window frames bring some warmth to the cool white walls, while the high ceilings ensure a fresh and open ambience in each and every room. Earth tones take pride in their work here, decking out the living area in a casual (yet very chic) atmosphere. And don’t overlook that tiled floor, adding just the right amount of pleasant vivaciousness. From a relaxed and friendly living room we travel to a charming kitchen in search of a snack. While a lot of houses use the flooring only for practical purposes, the flooring here are essential elements. They work the colour scheme, enhance the patterned feeling of the room, and manage to successfully separate the different spaces. Notice how light, fresh and positive the environment feels – a successful combination of the light walls, natural lighting, as well as the handful of artificial lighting elements (any meal will be a festive occasion with that decorative chandelier close by). The beautiful and rustic dining space is within arm’s reach from the kitchen, with a striking dining table taking centre stage at mealtime. And now a closer look at the culinary side. The stunning addition of warm wooden elements leaves a country air to the kitchen. The built-in china cabinet, refrigerator area, bar stools and cabinets play off beautifully against the pale tone of the walls and ceilings. A rustic extractor fan works the country elements beautifully—and that island seems like the perfect spot to have a quick chat while preparing lunch. We may have moved on to the more relaxed spaces of the house, but the style and visual aesthetics sure haven’t taken a rest. 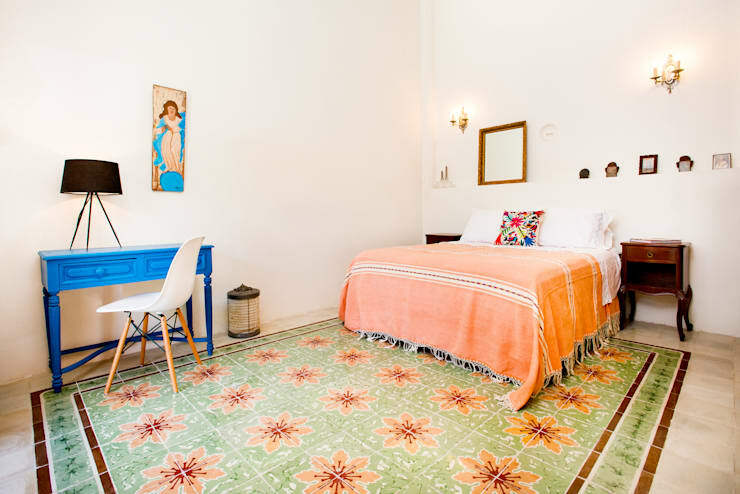 The colourful and cheerful floor dazzles this bedroom, turning this slumber spot into a jovial yet comforting area. Minimum decor, along with the blank canvas of the white wall, ensures that the chosen peach, blue and tea green shades positively light up. Take a look at the bright blue retro dressing table interacting most tastefully with the modern design chair, making for a unique (and delightful) decor addition. 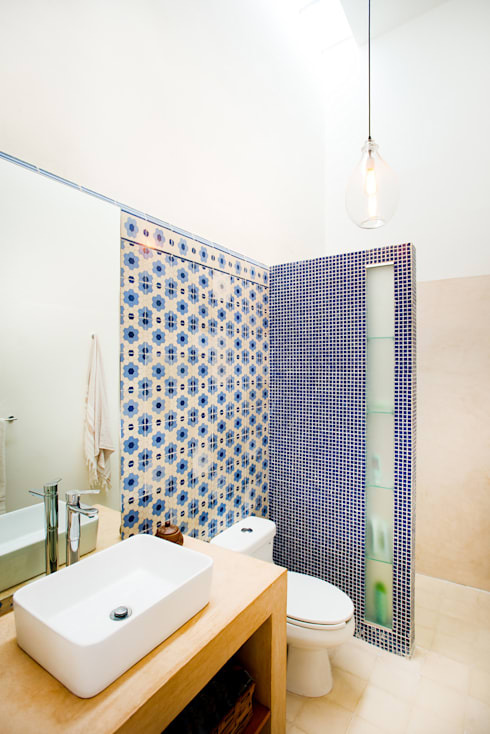 The calming touch of blue from the first bedroom meets up with us in the tiled bathroom, although in a wider variety of shades. The mosaic coating of the one wall, together with the adjoining lively wallpaper, adds a touch of cheerful embellishment to this bathroom. The bathroom sink ensures that the modern side of the interior eclectic style is continued, as does that stylish wooden cabinet. Whether you’re a devoted fan of the rustic style or a lover of a more modern approach, you are bound to find something you love in our delightful bathroom range. Bedroom number two opts for a slightly warmer touch in terms of its decor and colour scheme. 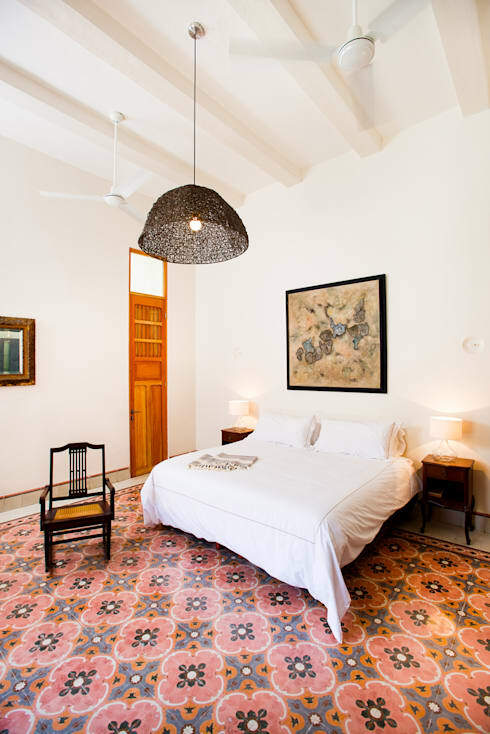 A hint of soft salmon pink highlights the floor pattern, enhancing the pristine whiteness of the ceiling, walls and linen. The rustic pendant lamp makes its presence known by offsetting stylishly against its (predominantly) white surroundings. Feed your creativity with some ideas for: Exceptional Bedroom Lighting. 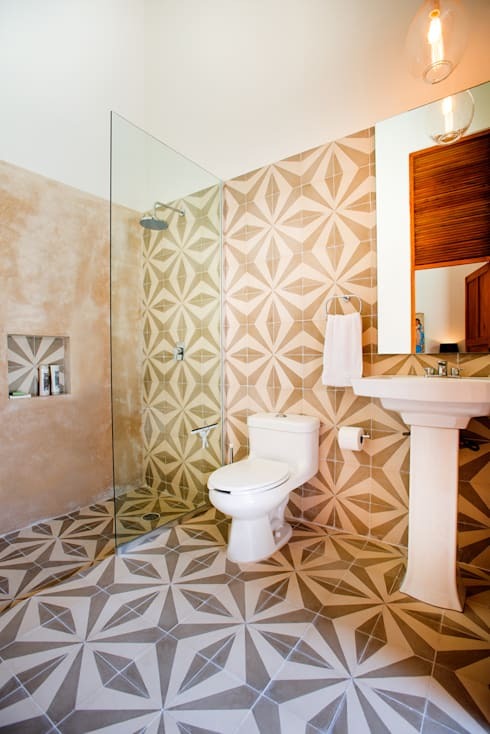 The second (and softer) bathroom, where a floral-inspired pattern chose to adorn the floor and walls (and superbly highlights the pristine white fixtures). A delicate ambience is experienced here (notice the soft finishing of the shower wall, almost candy floss-like) that fits in magnificently with the rest of the house’s freshness and overall family vibe. A slim glass panel acts as a divider for the shower area (a modern touch), and we’re simply thrilled to see the reflection of that warm wooden finishing in the mirror against the wall. A lot of times, architects opt for busy, intricate designs, forgetting that simplicity is often the best choice. Not here! Just notice the delicate external staircase rail, its smooth lines serving as both a clear contrast from the white steps, and also a soft modern whisper in this eclectic setting. Golden tanned concrete flooring play the perfect understudy for a beach landscape next to the fresh blueness of the swimming pool. And hints of green foliage continue to add to the softness of this neutral colour scheme. A perfectly pleasant setting for a charming family. No overly elaborate décor or intricate layouts – the perfect house to live in! What do you think?